Almost all umpiring decisions in a baseball game are objective, meaning they’re verifiable by instant replay and inarguable. This is because the rulebook is pretty clearly defined, but also because baseball is not a contact sport, where subjective penalties are put in place to regulate the contact. Even the most minute measurement in baseball, the ball and strike, is determinate. Fundamentally, it’s easy for a computer to determine when a sphere crosses the front, square cross-section of home plate. Compare that with football – it’s nearly impossible to devise a great way to reliably determine the exact spot on the field that a football should be marked – or basketball, where contact is constant and subjectively enforced. What it all boils down to is this: I don’t envision umpires making judgement calls as crucial as the ball and strike for very long, except (perhaps) for the rare check swing, which may prove harder to automate reliably. After all, even television broadcasts and internet sabermetricians have had access to real-time pitch placement for years. Technology available in 1990 could reliably get this information into the hands of umpires in real-time. Whether ball and strike calls become electronically determined in 2016 or 2020 is anyone’s guess, but I’m willing to wager that it’ll be before the 2022 season. I use the 2022 season because it’s especially poignant to one of the Padres’ most valuable assets, Austin Hedges. Austin Hedges is the Padres’ top prospect, according to at least one outlet. He’s been called a defensive wunderkind since he was drafted, and some scouts have gone so far as to say he’s been Major League ready defensively since he was 18. Hedges’ imminent promotion to the Major Leagues, whether in 2015, 2016, or 2017, means he’ll be under Padres team control through, roughly, 2022. It’s pretty important, then, that his defensive value lasts just as long. But what exactly is the value the catcher defense? There are three elements: throwing out base runners, calling pitches, and pitch framing. Throwing out base runners isn’t actually that valuable. Yes, the ability to produce extra outs from throwing out base runners is nice, but it is a skill that discourages the skill from being tested at all, since teams run less on better defensive catchers. Ultimately, the value here is in mitigating the volume of stolen bases, but that’s not a large effect anyway, given the negative value teams accrue when a caught stealing occurs. In other words, throwing out base runners isn’t that valuable of a trait, with a runs added/saved value in single digits according to widely available research. I am not aware of any research into catcher ability to strategically call pitches. It seems that this would be a difficult thing to prove in a study – swinging strike percentage increase? – since it’d need to be decoupled from pitch framing. This brings us to where the true defensive value of a catcher resides: pitch framing. Earlier this week, on the heels of several seasons of progress on the public availability of such data, Ben Lindbergh of Grantland.com published an article on the history of pitch framing data. Besides highlighting some interesting statistical oddities – for example, how Jose Molina was a considerably more valuable player than Jorge Posada because of pitch framing – the article brought up the pitch framing prowess of Austin Hedges. To put it mildly: Austin Hedges may be the Padres’ best catcher right now, even if he hits .200. At +37 runs above average, his 2014 pitch framing W.A.R. component would have made him one of the most valuable catchers in Major League Baseball. On one hand, I’m ecstatic the Padres possess this guy in their system, even if pitch framing is the most boring way a player can contribute to his team. On the other hand, almost all of Hedges’ value is beholden on Major League Baseball keeping balls and strikes a subjective call, and/or keeping umpires softly regulated in their strike zone accuracy. In other words, the Padres have a very valuable prospect whose value is a ticking time bomb, ready to explode whenever MLB “gets with the program” and starts actually enforcing it’s most crucial call as accurately as possible. So what should the Padres do? In the immediate future, if Hedges’ defensive value is as high as the analytics suggest, there’s actually a reasonable case that he’s the best catcher the Padres possess, including Derek Norris. That sounds crazy, I know. In an ideal world, the Padres would continue to develop Hedges’ bat in the minor leagues until it was at least passable at the Major League level. The development path would also allow the team to maximize the Major League value Hedges would return in his six team-controlled seasons, as delaying Hedges’ promotion until 2016 or 2017 means the Padres keep Hedges further into his prime. But what if balls and strikes are electronically enforced sooner rather than later? Hedges probably wouldn’t have much value at all, if he retained any positive value whatsoever. Ordinarily, I’m all for the Padres possessing high variance assets, as teams operating on low budgets have little way of acquiring high upside players (since they tend to shy away from pursuing players in free agency). But I can’t help but wonder if there are any teams in Major League Baseball who would completely overlook or dismiss the pitch framing time bomb. Given the wide variety of baseball behavior exhibited by today’s front offices, there has got to be at least one team willing to pay full market value for Hedges’ pitch framing ability. 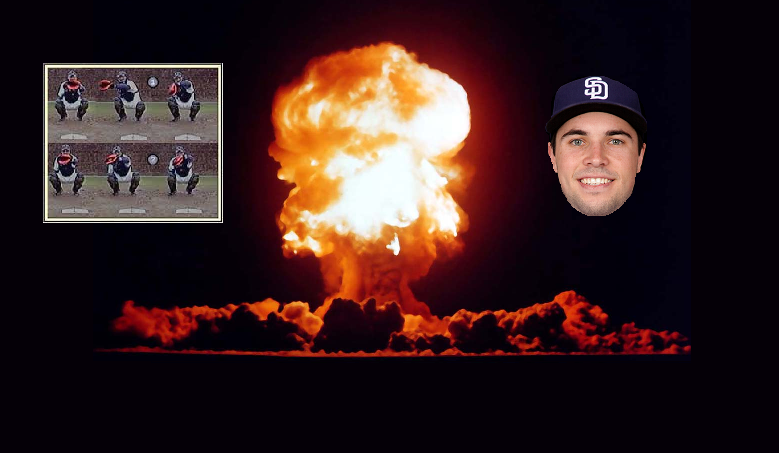 I guess what I’m trying to say is that if I were in charge of the Padres, I’d either start the season with Hedges in the Major Leagues, contributing to a potential 2015 World Series run, or I’d find that one team out there willing to pay for Hedges’ pitch framing value for his entire rookie contract, and deal him now. As tempting as it is to develop Hedges properly and maximize his long-term value, it’s a gamble not worth the return. Special thanks to Richard Wade from Bolts From The Blue for editing this post for clarity.